Is your Push helping you make music you’re proud of? Or is it quickly becoming another piece of unused hardware collecting dust in your studio? Wipe that dusty Push off, because music creation with Push just got even more exciting, and easier! If you hadn’t heard, Live 9.7 brought some seriously inspiring new features and updates on Push 2. Don’t worry, we’ve got you covered! In a series of videos, Ableton Certified Trainer, Brian Funk, will reveal how you can use these new features to be more productive and creative with your Push. In today’s video, Brian unveils 2 brand new slicing modes for Simpler, and investigates the new Layout for Drum Racks and Simpler, 16 Velocity Levels. Get ready to start chopping up samples like an Ableton samurai warrior! If you want to get the most out of your Push, and get access to an unlimited world of music making possibilities, then we highly recommend checking out Ableton Push 2 Jumpstart with Ableton Certified Trainer, Brian Funk. 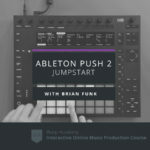 Ableton Push 2 Jumpstart is a brand new course built from the ground up. You get a comprehensive look at the ultimate way to integrate Push 2 and Live, an after taking Ableton Push 2 Jumpstart, you’ll know the Push inside and out! Watch free full length preview videos from the course and learn more here! Brian Funk, aka AfroDJMac, is a multi-instrumentalist, singer/songwriter and Ableton Certified Trainer from New York. He began his musical career with the guitar, playing in numerous rock bands, recording albums and embarking on tours of the East Coast of the United States. In an effort to expand his studio’s capabilities and songwriting arsenal, Brian turned toward computer-based music in 2006. As a guitarist and songwriter, he found Ableton Live to be the ultimate tool to unlock his creativity and bring his studio creations to the stage. A curious sound designer, Brian regularly releases free Ableton Live devices that challenge conventional sound-design-thinking, via his website and YouTube channel. His series of Two Minute Ableton Live Tips earned him the title of true “a legend in the Ableton Community” (Ableton Blog 6/26/12). As a writer and high school English educator, teaching Live and music production is the perfect marriage of two life passions. Brian specializes in teaching Live for songwriters and rock musicians, home and professional studio application, and live performances. His experience as a rock musician offers students a unique insight into bridging music of the past with the music of the future. 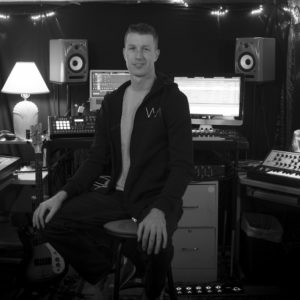 Brian has written, authored, and produced various courses on Music Production and Ableton Live. He teaches Advanced Music Production with Ableton Live at Berklee Online. Along with his own blog, Brian writes for various music publications on the web.